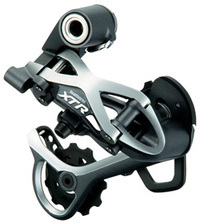 Now that Shimano has finally posted the details of the new 2007 XTR group and I've had a chance to digest some of the analysis, I thought I would post up a few thoughts (for what they're worth). In theory at least, Shimano has removed nearly all of the complaints that a cross-country/trail/all-mountain rider may have had with the previous group. They have not only matched all of the perceived advantages of the Sram X.O group, but offer a greater range of technologies from which to choose based on riding style. About the only choice provided by Sram that has not been matched by Shimano is the grip shift option. Choice abounds; particularly among the rear derailleurs and shifters. Riders can choose from either a traditional style top-normal or the more recently introduced low-normal derailleur. In addition, either dual-control or rapidfire shifters can be mixed and matched with either of the derailleurs. Although Shimano is clearly guiding riders toward one of the following combinations dual-control/low-normal or rapid-fire/top-normal shifter/derailleur. Shimano took a ton of heat from the dual-control/low-normal naysayers over the past two years. It's good to see that they did not abandon this promising technology, but instead chose to improve it for 2007. One of the best things about low-normal shifting is the ability to effortlessly move to lower gears under load while climbing. This is a big advantage to the cross-country rider. The problem was that Shimano's former dual control shifter limited shifts to one gear at a time. For 2007, this problem has been solved with Shimano's new multi-release shifting available on both the dual control and rapid-fire shifters. While we're on the subject of dual control, I suspect this is the real reason for the lackluster adoption of the low-normal shifting system. The previous dual-control shifter was both long and fixed with regard to the reach or distance between the brake lever and the handlebar. For 2007, Shimano has reduced the size and shape of the lever as well as provided for reach adjustment. I hope these changes along with the new multi-release shifting option encourages cross-country riders that previously shunned the concept to give it another look. If there's one problem with the new group it may be that there are too many options. Choice is usually a good thing for consumers, but it can sometimes cause confusion. Shimano will have to clearly articulate the benefits of each of the options and be consistent in its messaging. Also, retailers will have to be well educated on the pros and cons of various setups. I suspect that savvy high-end consumers will want to test ride several combinations, potentially lengthening the sales cycle. Retailers will probably also encounter more requests to swap parts according to rider preference. This will require excess inventory and could keep prices higher than normal. Of course performance is what matters. All of these features sound great, but it won't be clear if Shimano has truly hit the mark with this new group until we get some first hand reviews. I, for one, can't wait to get my hands on some of these combinations. Update - April 5, 2006: The comments below refer to the design of the XTR crankset. Here is a photo from a dutch website that claims to be of the new XTR crankset. I'm not so sure we are seeing it in it's final form, however.